Established in 1838 and considered one of Texas’ oldest cities, Seguin was once home to as many as 90 limecrete buildings, an innovated construction method that used local gravel. The Magnolia Hotel is one of about 20 of these early concrete buildings to survive. The Magnolia Hotel opened in Seguin as early as 1847, serving stagecoach travelers passing through the town conveniently located between Gonzales and San Antonio. The 20th century was not kind to the Magnolia Hotel. The construction of fire-proof brick hotels lead to its decline and during the 1930s, the Magnolia was converted to small apartments to accommodate the oil field workers during the oil boom. The last residents moved out of the building around 2000. The Magnolia Hotel is currently vacant. The building is open to squatters and susceptible to vandalism and arson. Seguin is committed to the preservation of its historic downtown and landmarks while a new purpose for the Magnolia Hotel proves to be a huge challenge and financial burden for its owners. 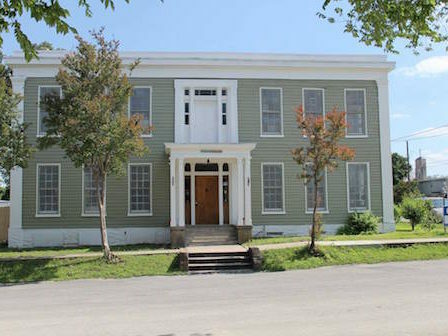 Recent efforts have restored Seguin’s historic Texas Theatre and motivated private investment in historic downtown buildings. It is the hope that these activities will encourage another success in the preservation and reuse of the Magnolia Hotel. UPDATE: In 2013, the Magnolia Hotel was purchased by private citizens with the intent to restore the property as a residence and event space. They have worked with the City of Seguin to begin the restoration of the exterior facade and several interior rooms, and have conducted research into the history of the Hotel.